“As a matter of urgency, the Ministry of Finance continues to work toward a contract with our international partners to replace the airport terminal building that is well past the end of its useful life,” a spokesperson said. “The negotiating parties are near an agreement to provide Bermuda what it needs to bring our airport facility into the 21st century, without compromising the Government’s ability to meet its other responsibilities to the people of Bermuda. “In the absence of any viable alternative, we need to vigorously pursue this transaction as the only suitable solution that accomplishes our aims,” the Ministry added. Where was the other viable options to see the reasoning behind selecting Aecon? When will this question be fully answered other than rumors. How about forget the big pools and put that money towards a covering for the parking, even if it isn’t a concrete one, something similar to the one over the old No. 1 Shed. That pool thing really grinds my gears too. What a waste of money when all you can see around the airport is ocean views. Just mentioning so please don’t shoot me. But that pool might have something to do with the A/C. Depending on if its close loop system or not. How can such a statement be made? The Minister defended his position of not seeking other bids and proposals. So how can this be the only viable solution when the Minister admits that he did not look for any other solutions? “Without compromising the Government’s ability to meet its other responsibilities to the people of Bermuda.” – You are going to put us much further into debt with this deal. Please explain how that is not compromising our future responsibilities? so whats a better option? do nothing? tender the thing out and pay for most of it ourselves? 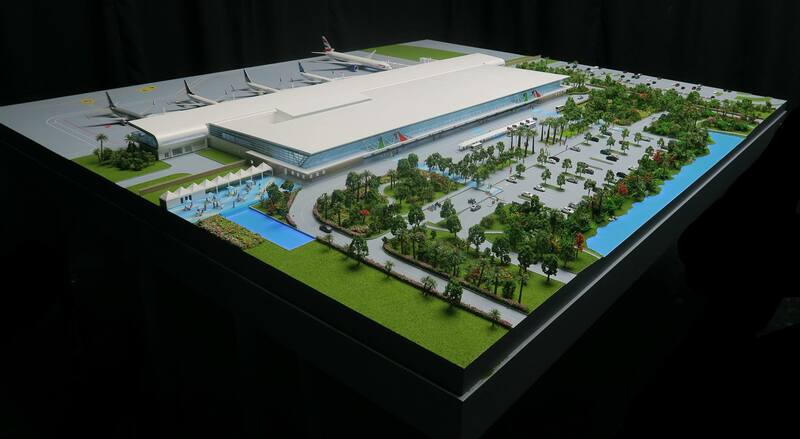 Let the PLP build their version of the Airport? The only way to find the best option is to actually look for the best option. This WAS NOT done. No other options were even considered. Who said anything about the PLP why does this issue need to be politicised? When will the older generation grow out of the past and let the younger generation have something we will be proud of? The older generation is the one making the most noise about this. As a young Bermudian I’m happy to see changes to our island which WILL benefit us and future generations to come. Its time move forward and not backwards which seems to be the thing nowadays. We WILL be stuck with the bill if and when CCC arent making their qouta from airport revenues. I dont feel comfortable stacking more debt on my one year old. We do have a lot of un-informed back seat drivers with nothing better to do on many of these blogs. Looks like a big city American airport….nothing Bermudian looking about it AT ALL except for the guys in the video walking around in Bermuda shorts! Again, who had the brilliant idea to build it at the end of the runway? If there is an emergency? Where in the world have you EVER seen an airport built at the END of the runway? Nothing wrong with out little Bermudian style airport. If it needs expanding, expand it. If it needs an overhaul, overhaul it! Save 1/2 the money and use what we have already! ABSOLUTE wast of taxpayers’ money! ABSOLUTE WASTE!